Doki Godwin Iyenkedi popularly known as stage name Yen-D. Hails from Bayelsa state but born and brought up in Amathibi Community, Ajapa Town, Ukparama ward 2, Arogbo Ibe, Ese-Odo LGA Ondo state. Based at Lekki phase 1,Lagos, Born on the 6th Feb. 1990. Yen-D is a Talented Dj, Afro Pop Singer, Songwriter, Composer and Promoter. Dj work Trained by Dj Pherow. DMG ENT. He started his music career at the Age of fifteen 15 years finally released his hit Afro Pop Reggae single track, on the 1st Dec. 2018. 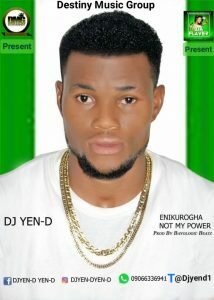 Titled Enikurogha means (Not My Power) prod by Bayologicbeatz. Expect more hit from Dj Yen-D. Almighty God is involved.